Organic matter exuding from chicken carcasses, "chicken juice", provides these bacteria with the perfect environment to persist in the food chain. This emphasises the importance of cleaning surfaces in food preparation, and may lead to more effective ways of cleaning that can reduce the incidence of Campylobacter. The study was led by Helen Brown, a PhD student supervised by Dr Arnoud van Vliet at IFR, which is strategically funded by the Biotechnology and Biological Sciences Research Council. Helen's PhD studentship is co-funded by an industrial partner, Campden BRI. The researchers collected the liquids produced from defrosting chickens, and found that this helped Campylobacter attach to surfaces and subsequently form biofilms. 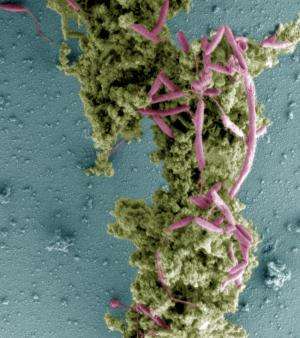 Biofilms are specialised structures some bacteria form on surfaces that protect them from threats from the environment. "We have discovered that this increase in biofilm formation was due to chicken juice coating the surfaces we used with a protein-rich film," said Helen Brown. "This film then makes it much easier for the Campylobacter bacteria to attach to the surface, and it provides them with an additional rich food source." Understanding this and how Campylobacter persists in the food production process will help efforts to reduce the high percentage of chickens that reach consumers contaminated with the bacteria. Although thorough cooking kills off the bacteria, around 500,000 people suffer from Campylobacter food poisoning each year in the UK. Reducing this number, and the amount of infected chicken on supermarket shelves, is now the number one priority of the Food Standards Agency. "This study highlights the importance of thorough cleaning of food preparation surfaces to limit the potential of bacteria to form biofilms," said Helen.